Review: Have you ever wanted to read a thrilling story with lots of twist and turns, as well as mayhem and adventure? 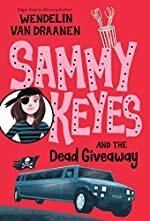 Well if so then Sammy Keyes and the Dead Giveaway by Wendelin Van Draanen is the right book for you! This book is full of adventure with my all time favorite Character, Sammy Keyes and of course along with her, her many friends and adventures! Sammy is a wild and kooky girl who loves adventures and mysteries! She can’t help but to get into trouble once again, only this time it’s dangerous! There are many thrills, spills and conflicts in this book! This is book number 10 and follows after book number 9, Sammy Keyes and the Psycho Kitty Queen. This book has many different exciting and interesting locations where it takes place, like an old house full of parts of trains and cars, a school, Sammy’s home and more! Sammy’s been working hard this year and her old enemy Heather still bugs her to this day, and for once Heather gets in trouble, only this time it really was Sammy! Sammy was wandering through the classroom early to drop off her books and bags and who does she see flying towards her full speed ahead? Tango! Mrs. Ambler’s new lovebird, so what does Sammy do she forces the door shut, and as she opens it slowly she hears a small thud. The main mystery of this story involves figuring out why someone is trying to get Sammie’s favorite dog killed! Overall this is a great book that is very stimulating and keeps you up for hours and hours reading more! It has many twists and turns with unexpected surprises! I think children with better understanding of mysteries would be well suited to read this book, but the readers should be a little more mature due to some language, and very minor violence. I would suggest age groups 9-12+. It is just as good a book as the others in the series if not better! I would advise all readers who love a good book to start cracking on this one! Wendelin Van Draanen has had numerous awards: State Award Master, Christopher Medal, Edgar Allan Poe Award for Best Children’s Mystery four times in the past six years, and California Young Reader Medal. This author is highly skilled and I would suggest any of her books any day! Review written by Tiffany, Grade 6. Date of review: October 2008.